It’s very simple but absolutely gorgeous. When I shop for sarees in India, I always have to argue with the sales guys to show me “Simple! simple! more simple! !” They only want me to see the ones decorated like Christmas trees. Now somebody quick! Get married and invite me so I can wear it! Posted on May 9, 2008 at 2:54 pm in Memsaab in a saree	| RSS feed You can skip to the end and leave a reply. Thats a wonderful saree… Awesome.. 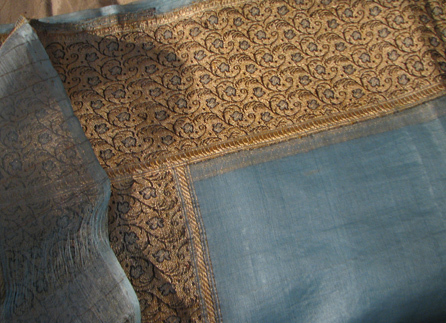 I love finding old sarees intact…so many of them have been cut up. It’s really lovely, very soft. A bet it’s so comfortable to wear! 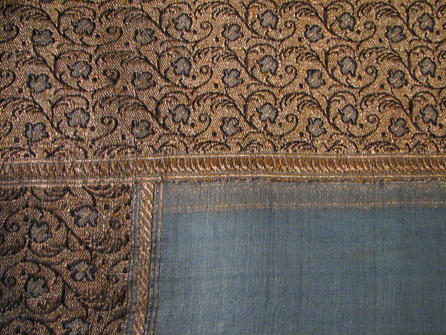 This saree, however, is too casual for a non-widowed woman to wear to a wedding. what a beautiful sari!!! where did you get it from? i would like to see i picture!!! I’m so glad others appreciate its beauty! Most of my friends (and family) just think I’m crazy. I think this is probably vegetable dye, I always think those colors are so much richer and more beautiful than artificial dyes. I got it where I get everything I own: on eBay. The sari is so beautiful – I absolutely love the colour, and it looks so soft and… welcoming, somehow. I had the same experience in India – ‘more simple, simple, simple’! That is a beautiful saree indeed! I am sure with the right kind of accessories you can carry it off well at a wedding! How about a trail photo of yours in that saree? Oh, and I HAVE the accessories :-) Maybe one of these days I will do a modeling session. is intersed to buy them caontact me as soon as possible.